Clinical trials and health research are invaluable tools to advance individual and public health around the world, but the communities represented by the Diverse Elders Coalition — including American Indians and Alaska Natives, Asian Americans and Pacific Islanders, Hispanics and Latinos, and Lesbian, Gay, Bisexual, and/or Transgender (LGBT) people — are often underrepresented in these initiatives. In fact, because of a lack of comprehensive, disaggregated data collection, participants may not be able to indicate their sexual orientation or gender identity, and no distinction may be made between South Indians, Southeast Asians, or East Asians — they are all lumped into one “Asian” category. This may mean that medicines and other therapies are less effective or ineffective for diverse elders, or they may have unexpected side effects, compromising our ability to age in good health. Why are diverse elders underrepresented in health research? Language: The communities represented by our coalition speak hundreds of different languages and many older adults in these communities are limited English proficient. However, invitations to participate in U.S. clinical trials are generally offered only in English. Important information about how to enroll in these research opportunities, as well as the risks and benefits to doing so, may not be successfully communicated to diverse elders. Trusted messengers: Even when materials have been translated into multiple languages, they may not be reaching elders in the communities where diverse older adults live and work. Ongoing engagement with community-based organizations and programs that serve diverse elders is necessary to build trust and encourage participation in research opportunities. A study of Chinese American, Korean American and Vietnamese American adults found that in-person contact with a trusted healthcare provider or community-based organization would improve participants’ understanding of a clinical trial being offered and increase the participants’ interest in participating. One community health worker who works to improve health in the Hispanic and Latino communities noted that the many avenues she uses for successful outreach include town hall meetings at churches and community health centers, face-to-face group education programs, Spanish-language radio and social media. Experiences with trauma: Many of the communities represented by the Diverse Elders Coalition have experienced discrimination, marginalization, and trauma at the hands of researchers and governmental agencies. While recent studies have found that communities of color are still interested and willing to participate in health research, researchers should still be cognizant of the injustices that our communities have faced in the past and how that impacts our health and our experiences in healthcare. American Indians have faced forced removal from their lands by the U.S. government, restriction and elimination of religious practices, and dissolution of their tribes. LGBT communities have had their identities criminalized, facing bullying, harassment, imprisonment and violence for who they are or who they love – and legal protections that have been enacted for LGBT communities are facing rollback and reduction. Black and African American communities have been subjected to brutal and unethical experimentation, from the Tuskegee Syphilis Study to research on Black women, children, and prisoners of all genders that has occurred in more recent years. And many women and other people with uteruses in our communities have faced forced sterilization, either as a means of punishment or population control, or under the guise of scientific research. Researchers must understand these complicated dynamics when recruiting participants to clinical trials and ensure that the research is culturally competent and historically sensitive. Precision medicine is an emerging approach to disease treatment and prevention that considers differences in people’s lifestyles, environments and biological makeup, including genes. 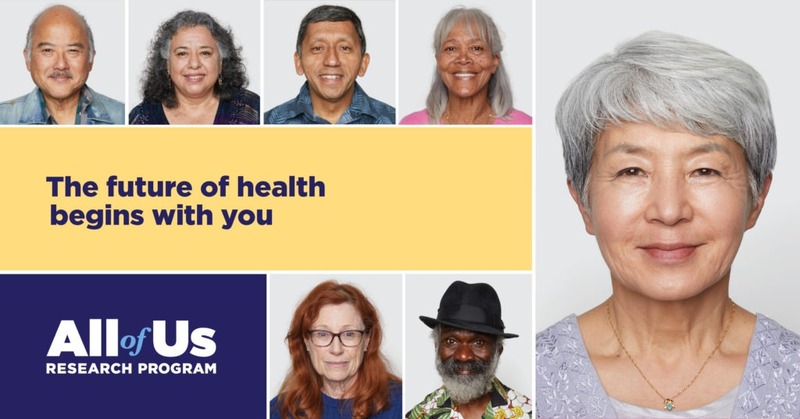 By partnering with one million diverse people who share information about themselves over many years, the All of Us Research Program will enable research to more precisely prevent and treat a variety of health conditions. “The time is now to transform how we conduct research — with participants as partners — to shed new light on how to stay healthy and manage disease in more personalized ways. This is what we can accomplish through All of Us,” said National Institute of Health Director Francis S. Collins, M.D., Ph.D. Participants are asked to share different types of health and lifestyle information through online surveys and electronic health records, which will continue to be collected over the course of the program. At different times over the coming months and years, some participants will be asked to visit a local partner site to provide blood and urine samples and have basic physical measurements taken, such as height and weight. In the future, participants may be invited to share data through wearable devices and to join follow-up research studies, including clinical trials. How is All of Us working to enroll diverse participants? The All of Us Research Program considers the many factors that have historically prevented the communities represented by the Diverse Elders Coalition from participating in research and is working to build bridges to invite those communities to participate in this groundbreaking program. All of Us is partnering with trusted community partners, such as Diverse Elders Coalition member organization the National Hispanic Council on Aging, to ensure that their outreach efforts are culturally and linguistically competent. Factors such as the current political climate — which has created fear and unwillingness to reveal personal information to the U.S. government – have been considered by the All of Us leadership. To that end, a Social Security number is not required to participate. Additionally, mobile enrollment and outreach units are visiting rural communities, where access to the internet may be limited. All of Us seeks to transform the relationship between researchers and participants, bringing them together as partners to inform the program’s directions, goals and the responsible return of research information. Participants will be able to access their own health information, summary data about the entire participant community and information about studies and findings that come from All of Us. “All of Us” is a registered service mark of the U.S. Department of Health & Human Services. Support for this blog post was provided by the All of Us Research Program.